BEREA– Baker Mayfield went from scowling at Hue Jackson to glaring at critics. Three days after he tried to embarrass his former coach with a prolonged stare down in the closing minutes of Cleveland’s win over Cincinnati, Mayfield owned up to his actions and then said he doesn’t regret them. 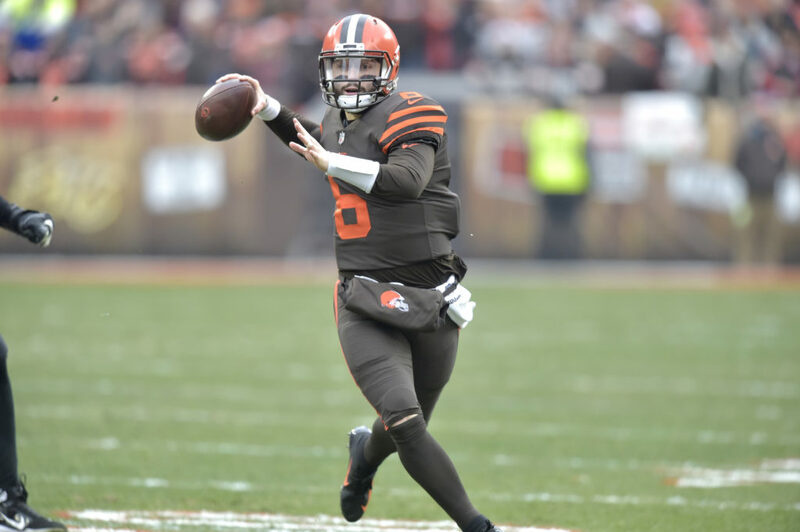 With the Browns clinging to an eight-point lead Sunday, Mayfield connected with tight end David Njoku for a game-sealing 66-yard gain. As he ran past Cincinnati’s sideline, the rookie quarterback looked directly at Jackson, who was fired earlier this season by the Browns. Mayfield then kept his eyes trained on Jackson as he shuffled and backpedaled his way down the field. Following the game, the No. 1 overall pick, who has guided the Browns to the biggest one-season turnaround in franchise history, said “No idea what you’re talking about” when asked about his antics, which came a few weeks after he gave Jackson the cold shoulder following a game in Cincinnati and called his former coach “fake” on social media. The glowering gaze — and an earlier crude gesture he performed on the sideline after throwing a touchdown pass — drew criticism that Mayfield simply dismissed. He’s not going to change his act. “I’ve said it, I’m not a cookie-cutter quarterback, but everybody is different,” Mayfield said. “Everybody leads a different way. Everybody is competitive in a different way. I’m not trying to be anybody else. I’ve been who I am and that’s gotten me here. I’m going to continue to do that because I try to improve every week. I’m not trying to get anybody’s approval. I’m trying to win football games and do this for as long as I can. That’s the goal. Of course, Mayfield’s on-field behavior is nothing new. He earned something of a bad-boy reputation while at Oklahoma, where among other things, he grabbed his crotch while taunting Kansas players; tried to plant a Sooners flag in the middle of Ohio State’s field after a win; and got arrested for public intoxication and disorderly conduct during the offseason in Arkansas. Mayfield has apologized for those incidents. But as for his behavior as a pro, he said he’s not concerned that he’s pushing things too far. There’s no denying what Mayfield has meant to the Browns (7-7-1), who in addition to spoiling the Ravens’ playoff hopes can clinch their first winning season since 2007. He’s 6-6 as a starter, thrown 24 touchdown passes — two shy of the NFL rookie record — and has an entire city believing that pro football is finally back. Mayfield has almost singlehandedly revived the Browns, who are willing to deal with the consequences of his conduct. NOTES: Rookie CB Denzel Ward remains in concussion protocol and could miss Sunday’s finale. … DT Larry Ogunjobi (biceps), C JC Tretter (ankle) and LB Tanner Vallejo (hamstring) also sat out practice. … Bitonio was selected the team’s “Good Guy” award winner for his cooperation with the media for the second year in a row.